The Woolton Picture House was designed by L. A. G. Prichard, a well established architect and a member of the Royal Institute of British Architects. The Cinema was built for Alfred Adams, who formed the Woolton Picture House Co. Ltd. to operate the cinema and opened its doors in 1927. The Auditorium originally held a seating capacity of over 800, composing of several rows of wooden benches. Although during the 30's the screen was brought forward to accommodate larger speakers for an enhanced cinematic experience. Remaining open throughout the war years, surviving the bombing raids of WW2, the cinema provided the local community a vital window to the front line, courtesy of Pathe Newsreel. The cinema acquired a new owner in 1954 and was handed to Robert Godfrey of Cheshire Country Cinemas. The onset of a fire at the front of the screen drastically altered the cinema, almost destroying the public area of the Auditorium. The building survived but remained closed for 3 months during extensive repairs. During late December the cinema reopened with the showing of Walt Disney's 'Old Yeller'. Woolton Picture House was spectacularly refurbished with the front exterior, gaining prominent rows of large white, steel slats, new canopy and illuminated signs. In addition to a wall-to-wall screen proscenium, carpeting and 265 luxury pull-man seats the alterations created a spacious, comfortable surrounding. Woolton Picture House acquired a further owner, David Wood, grandson of cinema pioneer John. F. Wood. The sudden misfortune of the unexpected death of David Swindell the Chief projectionist, followed shortly after by the death of the owner David Wood, lead to the second closure of the cinema. Woolton Picture House closed with the film 'Pirates of the Caribbean' 2 on 3rd September. Woolton Picture House was purchased by a local business man and reopened on 29th March 2007 with the a full house screening of 'The Queen'. It also celebrated its 80th Birthday, becoming the oldest single screen cinema in Liverpool. In March 2009 Woolton Picture House became the set for the film 'Nowhere Boy', a biopic of John Lennon's adolescence and the creation of his first band The Quarrymen and its evolution into The Beatles. Woolton Picture House was also voted within the Guardian's Top 20 'Best Film Venues in Britain' describing the cinema as Britain's 'art deco gem'. The Cinema celebrated the film Premier of the Blockbuster movie 'Madrasapattinam' with film stars hosting the cinema's red carpet event. Woolton Picture House raised the curtains for Cancer Research and hosted an evening of the Silver Screen on behalf of Clatterbridge Cancer Research. A wonderful event for a worthy cause! Woolton Picture House was granted an Alcohol Licence, to the delight of our valued customers. The cinema Secured its continued future with the installation of a new digital projector and new screen with upgraded sound for our patrons enjoyment. Woolton Picture House was the 2015 winner of the Certificate of Excellence from Trip Advisor! A big thank you to all of you that have supported your local cinema and for you great reviews. The cinema is featured in the 'Reel Stories: Liverpool and the Silver Screen' exhibition within the Liverpool Museum! The exhibition celebrates liverpool's starring role in films over the past 60 years! 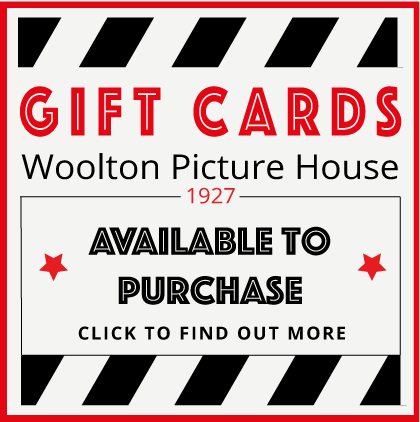 Woolton Picture House proudly joined Independent -Liverpool! Don't forget to support your local independent business and pick up your card! JD Sports hired the auditorium for an amazing advertisement photoshoot of the latest clothing lines.